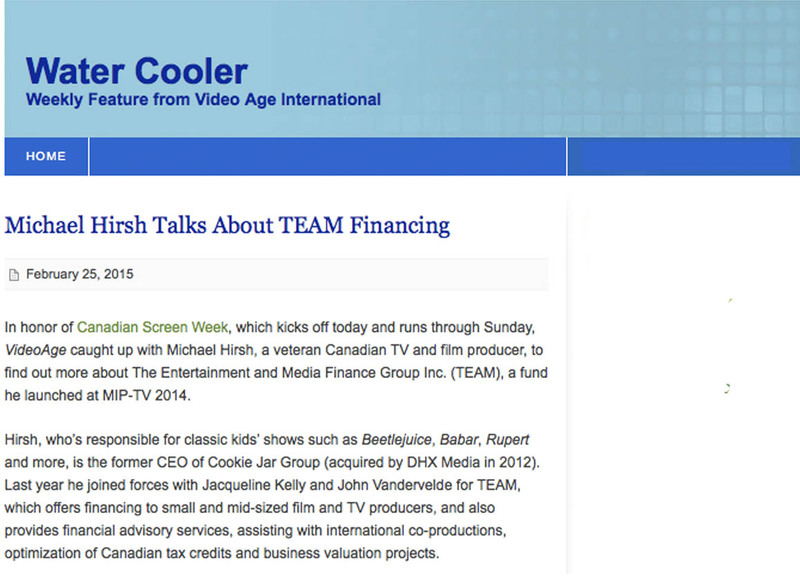 In honor of Canadian Screen Week, which kicks off today and runs through Sunday,VideoAge caught up with Michael Hirsh, a veteran Canadian TV and film producer, to find out more about The Entertainment and Media Finance Group Inc. (TEAM), a fund he launched at MIP-TV 2014. Hirsh, who’s responsible for classic kids’ shows such as Beetlejuice, Babar, Rupertand more, is the former CEO of Cookie Jar Group (acquired by DHX Media in 2012). Last year he joined forces with Jacqueline Kelly and John Vandervelde for TEAM, which offers financing to small and mid-sized film and TV producers, and also provides financial advisory services, assisting with international co-productions, optimization of Canadian tax credits and business valuation projects. VideoAge spoke to Hirsh about this endeavor. VAI: What was your goal in launching this fund? MH: We noticed a need for another strong, independent financing group, and we’ve helped people fund a lot of projects already. We also provide an advisory service for producers who want to buy and sell companies. It’s something that we’ve all experienced and know something about. VAI: Why was the timing right? MH: We launched after BMO Financial Group [Bank of Montreal] bought Aver Media [a private, Canadian-based film and TV media lending company], so there was one less independent. It’s good to have independent players, because at some point people can fall out with their banks. Having someone who can sort people out and get them back on track is useful. And that’s what we do. VAI: Where does the money come from? MH: We use a lot of bank financing. A lot of our clients need help structuring deals, and we help them work with traditional banks and we help them find alternatives to the banks. Money comes from everywhere — from traditional Canadian chartered banks to international funds. It’s diverse — both public and private. VAI: You’re known as a major children’s TV producer. Does the fund focus on children’s programming? MH: No, we work with every kind of programming. There’s some children’s content, but most isn’t. VAI: Can foreigners access the fund or is it only for Canada? MH: So far all of our loans have been to Canadian companies, but we would consider working with international companies too. VAI: What are some of the things you do as part of your advisory services? MH: So far, there have been some companies that want us to help them acquire other companies, others want our advice on going public. VAI: What do you think is in store for the Canadian TV and film industry? MH: We’re poised for the future. Canadian companies — including DHX [where Hirsh is a vice chairman] — have embraced digital media, and companies like Netflix and Amazon. The breakdown of the traditional business is actually good for Canadian producers, because we have easier access to new businesses. We’ve got good relationships with Hulu, Amazon and Netflix, and we’re growing together with them. A lot of those companies, particularly Netflix, have an international focus. In the traditional business model, the curator used to be a barrier to the audience, but that’s changing. The best example is YouTube. It doesn’t judge the program that’s on offer. Everything is broadening.